Supreme Court 2015: John Roberts’ ruling in King v. Burwell. Textualism? Purposivism? The chief justice comes down on the side of interpretive pragmatism. Photo illustration by Slate. Photo by Darren Ornitz/Reuters. I believe it has been several decades since any justice has favorably cited the canonical purposivist precedent, Church of Holy Trinity v. U.S. (1892), in which Justice David Brewer famously wrote for a unanimous court that “a thing may be within the letter of the statute and yet not within the statute, because not within its spirit, nor within the intention of its makers.” Advocates have absorbed the message, too: Invoking Holy Trinity would likely be seen as a virtual concession that one has no textualist legs to stand on, and therefore good lawyers avoid it at all costs. It has also become very rare for sophisticated advocates to argue that the court should reject a “plain text” reading on the grounds that would lead to absurd results. Today, it’s a faux pas to so much as suggest to the Supreme Court that absurdity or legislative purpose, standing alone, trumps text. 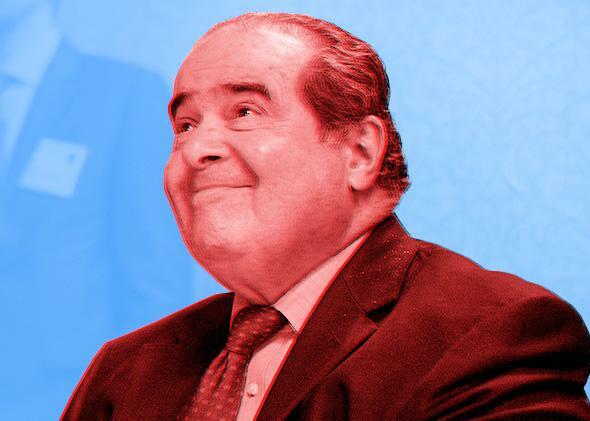 This fundamental transformation in the way statutory cases are litigated is a function of Scalia’s singular campaign (abetted by some like-minded scholars, including especially John Manning). It’s also very possible that this nominal revolution in statutory interpretation has had a meaningful effect on how lower court judges interpret statutes. Nevertheless, it’s not clear that the Scalian interpretive theories have had much of an impact on the Supreme Court’s own decision-making—not, anyway, as to statutes of great significance. Justices have frequently found plenty of creative ways—without expressly embracing older forms of purposivism—to interpret statutes to reflect what the legislature must have been getting at. In practice, that is to say, the court’s touchstone has been statutory pragmatism—trying to make sense of statutes in light of what Congress (or a reasonable legislature, in any event) must have been driving at. There’s good reason that Scalia dissented so vehemently in so many statutory cases last term—such as Bond, Aereo, and Abramski—because, in one such case after another, a majority of justices nominally invoked textualist canons without following them to what Scalia saw as their inevitable results. In some cases, of course—such as last term’s decision in Bay Mills, which Scalia cites in his dissent today—the court has been willing to follow the unadorned text even when it results in stark inconsistencies that the legislature probably would have rejected: As Justice Elena Kagan wrote in that case, the court “does not revise legislation … just because the text as written creates an apparent anomaly.” Those have been cases of little moment, however—those having relatively limited impact, and in which the statute’s sponsors could readily push Congress to fix any resulting anomalies. Far more often, if the “plain text” reading would require an absurd result, or one the legislature could not possibly have intended, the justices have employed interpretive canons sufficient to trump the pure textualist argument—or have discovered new canons to do the work (most strikingly, see the chief justice’s opinion in Bond, in which six justices expressly abandoned the plain meaning of a statutory definition so as not to effect a major shift in criminal jurisdiction to the federal government in poisoning cases). I’m certainly not the only one who thought that King v. Burwell would be the ultimate test case that would determine the fate of Scalia’s decadeslong campaign in statutory interpretation: If the court decided to follow the apparent “plain meaning” of ACA Section 36B, standing alone, and thereby had effectively wiped out the most important domestic statutory initiative in our lifetime, even though no member of Congress intended such a reading, or even contemplated such a prospect until months after the legislation was signed, then Scalia’s efforts would have carried the day, notwithstanding all the earlier cases where his textualism didn’t pan out: The payoff (and the implications for future legislation) would surely have been worth all the effort, at least from Scalia’s perspective. On the other hand, if textualism could not do the work in this case … then what, after all, has all the fuss been about? If tax credits were unavailable with respect to insurance policies purchased on an HHS Exchange, however, that Exchange would not operate anything like its State-run counterpart. Without the tax credits, consumers could not afford to buy insurance on the Exchange. And the HHS-facilitated Exchanges would then collapse as insurers dropped out. It would be absurd, indeed, for Congress to have insisted that HHS to set up such dysfunctional Exchanges, without the tax credits that are crucial to their operation. As the SG puts it (p.24), “[a]n Exchange without credits would be a rump Exchange bearing little resemblance to its state-run counterpart—if it could operate at all.” This wouldn’t merely be Hamlet without the Prince; it would be Hamlet without the Danish monarchy … more like Rosencrantz and Guildenstern Are Dead. But seeing as how the court is reluctant to invoke the “absurdity” canon, it was certainly sufficient to conclude that the plaintiffs’ reading was “untenable.” Untenable not in light of some abstract congressional “intent” or statutory “spirit” discerned from legislative history, but in light of the very context, operation, and structure of the statute that Congress enacted. And therefore if an alternative reading was even remotely available—and it certainly was—the only principled decision for the court was to adopt the reading that did not so render the statutory structure (not merely the legislative purpose) fundamentally dysfunctional and meaningless. This is the most important sentence in the chief’s opinion: “A fair reading of legislation demands a fair understanding of the legislative plan.” From Scalia’s perspective, the legislative “plan,” like “legislative purpose” and the “spirit” of the law, ought to be quite beside the point: To caricature the Scalian perspective just a bit—but only a bit—what the legislature “has done” is simply to enact certain words on a page; a collective legislature does not have a “plan” or an “intent” or a “purpose” that a court can divine. The Supreme Court on Thursday emphatically rejected that notion—sounding the death-knell, I think, for the Scalian revolution in statutory interpretation, in fact if not in form. And, most importantly, the court did so in the name of democratic governance.